This category includes establishments primarily engaged in the operations of timber tracts or tree farms for the purpose of selling standing timber. Establishments not holding timber tracts as real property (not for sale of timber) are classified in SIC 6519: Lessors of Real Property, Not Elsewhere Classified and logging establishments are classified in SIC 2411: Logging. In the United States about one-half of the country is wooded. This amounts to about two-thirds of the nation's presettlement forested land. About 500 million acres of this forested land is classified as timberland, or land capable of growing 20 cubic feet of wood per acre per year. About 130 million acres are owned by the federal government and other state and local governments. The remaining 300 million acres are in relatively small tracts owned by individuals, with 70 million acres being owned by commercial firms. Annually about 4 million seedlings are planted every day. Oregon, Washington, and California are the country's largest timber producing states, accounting for more than three-fourths of Western timber production. Timber is also the South's largest agricultural product. Live Christmas trees are grown in all 50 states. According to the National Christmas Tree Association, 22.3 million live Christmas trees were sold in 2002, down from 27.8 million in 2001 and from 33 million in 1997. For every Christmas tree cut and sold, the industry plants 2 to 3 seedlings. The industry employs about 100,000 full- and part-time workers and operates approximately 5,000 cut-and-choose farms. Depending on the species, it takes between 7 and 15 years for a tree to grow to an average cuttable height of 6 feet. The retail cost per foot for Christmas trees generally ranges from $3.10 to $5.65. The biggest expense for farmers is pruning each tree every year so that they maintain the classic, conical shape demanded by consumers. The leading states for Christmas tree production are Oregon, Michigan, Pennsylvania, California, and North Carolina. The most popular trees are the balsam fir, Douglas fir, Fraser fir, noble fir, Scotch pine, Virginia pine, and white pine. The Scotch pine is usually the largest selling tree, capturing between 30 and 40 percent of the market. According to the U.S. Department of Agriculture, the annual value of the U.S. Christmas tree harvest is around $440 million, with about 17,000 farms working nearly 137,000 acres. Tree farms cover a wide range of businesses. After they have cut the original stumpage, giant corporations like Weyerhaeuser plant second- and third-growth on vast timber holdings, which they may keep for their own use or sell. Small tree farmers manage woodlands that range from a few acres to several hundred acres. Some may keep the timber for a small sawmill they own, but most sell the stumpage, either for use in mills or as Christmas trees. Several of the giant timber producers run programs that assist small landowners in exchange for first rights on the timber. The industry continues to face competition from artificial tree makers, who captured half the market by the early 1990s. Most artificial trees are manufactured in Korea, Taiwan, and Hong Kong. These producers promote their trees as fire-resistant and perfectly designed, with no needles to be swept up. In addition, some argue that artificial trees are more ecologically responsible because they can be used more than once. The tree growers, in turn, say that real trees are a renewable, recyclable resource, while artificial trees contain nonbiodegradable plastics and metals. According to the Western Wood Products Association, demand for lumber in 2002 reached an all time high of 56.3 billion board feet, beating the previous record set in 1999 at 53.3 billion. It is estimated that 56.7 billion board feet of lumber was sold in 2003, setting another new record. Demand was expected to slip slightly by 2004 but nonetheless remain high. In 2002, 17.4 billion board feet came from the western United States, reflecting a 5.5 percent increase from 2001. Roughly 18.1 billion board feet were used for repair and remodeling, while 22.3 billion board feet were used for new construction. 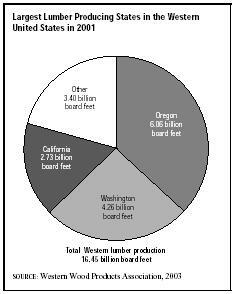 The United States imported 21 billion board feet of lumber in 2003, mostly from Canadian lumbering operations. While Canadian imports are expected to decline, European imports are expected to climb, due to increased production there. In the early 2000s, the U.S. International Trade Commission determined that Canadian imports of softwood may be detrimental to the U.S. lumber industry. As a result, when the 1996 Softwood Lumber Agreement expired in 2001, U.S. official began looking to increase the duty imposed on Canadian softwood imports. Officials from both countries continued to negotiate trade issues into the early 2000s. Industry leaders and their total 2003 sales are International Paper ($25.2 billion), which acquired Champion International Corp. for $7.3 billion in 2000; Weyerhauser ($19.8 billion); Boise-Cascade ($8.2 billion); and Georgia-Pacific's Timber Co. ($551 million), which was acquired by Plum Creek Timber Co. in late 2001. Kimberly-Clark ($14.3 billion) is a major manufacturer of personal paper products, but in 1999 it began divesting itself of its timberland operations. In June of that year, for instance, the company sold 460,000 acres of timberland in Alabama, Mississippi, and Tennessee to Joshua Management LLC for approximately $400 million. As of 2004, Kimberly-Clark was planning to spin off its paper, pulp, and timber assets as a separate entity. National Christmas Tree Association. U.S. Consumers to Buy An Estimated 23 to 28 Million Real Christmas Trees. St. Louis: National Christmas Tree Association, 2003. Available from http://www.christree.org . Routson, Joyce. "North American Industry Outlook Bright Over Next Two Years." Pulp & Paper. January 2000, 36-48. Vaughan, Kerry. "Builders Closely Watching U.S.-Canada Lumber Debate." Sacramento Business Journal. 22 June 2001. Western Wood Products Association. WWP: Western Wood Products Association. Portland, Oregon: Western Wood Products Association, 10 October 2003. Available from http://www.wwpa.org .